We've tested the Ignacio frameset before in its other guise as the Marin Dominican – but the Ignacio brings something new to the party. Well, new in the sense of 45 years old. But different. You know what I mean. 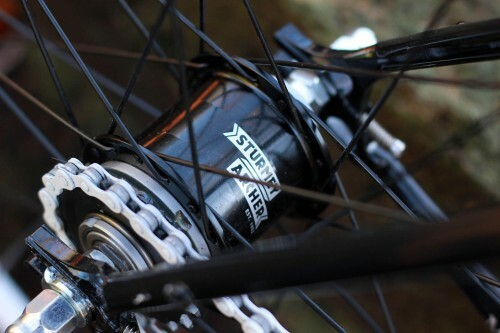 The something in question is Sturmey Archer's S2 Kickshift hub, first released in 1966 but lately resurrected as another gearing option for the style-conscious fixed crowd. The S2 is ideal for the job as it doesn't require any kind of cabling, you just kick back on the pedals to shift between the two ratios, direct drive and an overdrive of 138%. The hub is attached to a standard 44/17 drivetrain and laced into white 28mm section Alex rims, which contrast well with the neat black finish on the Cromoly frame. It's interesting that Marin haven't gone with the coaster brake option for the hub which would have allowed them to legitimately drop the rear anchor; as it is you get dual pivot brakes front and rear actuated by 'cross type levers on mini risers. All in all the look is almost indistinguishable from the cheaper Dominican with its fixed/free hub, and the components are more or less the same. After swapping out the very short seatpost and hopping on the bike for a blast round town, the first impressions of the hub were distinctly mixed. Obviously it's not possible to know what gear you're in when you're not turning the pedals, and I couldn't get the hub to reliably shift between ratios, leaving me struggling at junctions, especially on hills. It's all about the practice though, and once I'd got a feel for the change I was fine. The shift motion is a lot more subtle than you might expect and requires a little bit of finesse; you can change just by shifting the pedals back just a short way, so if you stop at the lights and rock the pedals back to starting position there's every chance you'll change ratios. You get used to rolling up to the lights with the pedals moving to get into postition before you stop, though. It's not hard. The stock ratios are way too big for hilly Bath. 44/17 (69") is about as long a gear as you want for round here on a sigle-geared bike, and the 95" overdrive is effectively useless. We swapped the 44T chainring out for a 39T, giving an 85" overdrive and a 61" climbing ratio. You could go even lower and still get a usable cruising gear. the 38% gap is a big one which takes some getting used to, but the upside is you get widely spaced gears that I found made the Ignacio far more enjoyable on longer rides than its singlespeed counterpart. I managed 60km rides on the Ignacio with no issues at all, and it's plenty happy cruising the B roads. In town the short wheelbase and quick steering make it very agile, and if you're careful to get into direct drive (assuming you downgear, like I did) then it's very nippy away from the lights. Put the power down and there's a bit of sideways movement but nothing to worry about, the drivetrain feels very efficient and there's no noticeable difference in efficiency between the ratios. The Dominican is a comfy bike and the Ignacio is too, the springy frame and big tyres keeping your bum happy. It's less good news at the front; you'll only forget your gloves once before you realise that the grips are more ornamental than anything else, and the risers are pretty stiff beasts too, mostly by dint of them being narrow. That being said, it makes the steering pin sharp. We've already said that 2011 will be the year of the urban gear and it starts here, with two instead of one. The Ignacio is a better bike than the Dominican for having the extra ratio, in my opinion. Okay you can't ride it fixed but the kickshift makes it better over long ranges without compromising the look or the urban handling. I liked the hub a lot, enough that I bought one to build up into a project bike. My one sticking point is the price. At £699.99 it's £150 more expensive than the Ignacio, and the only real difference is the S2 hub which you can pick up (admittedly they're not easy to find) for about £70. A rim and a wheelbuild will set you back about the same again, meaning you can buy a Dominican and get someone to build up an extra wheel with the kickshift for the same as it costs you to get an Ignacio at RRP, and you can choose between one speed or two. That seems a bit silly to me, but no doubt market forces will mean that the actual price you pay for one will adjust itself over time. A quick scout around the corners of the internet reveals that at the moment it's still going at the asking price. Sturmey's two speed unit definitely brings something to the party, making the Ignacio a more interesting bike than its singlespeed sibling. The price differential is more than you'd expect from just speccing a different hub though, making the bike seem less good value than the Dominican. fine, though i had to swap out the seatpost for something a bit longer. Yes. 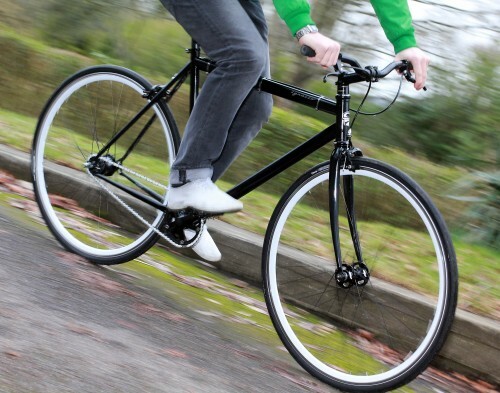 The springy steel frame and big tyres make it comfy even over longer distances. Nice review. I like the look of that hub. Does it shift whenever you backpedal, or do you have to kick back in a particular way to make it shift? Can you shift on the fly and/or stationery? whenever you backpedal, pretty much. yes, you can shift whenever you like. I've been considering buying an S2 hub for a while now. When not out on a longer ride, I love the simplicity of singlespeed/fixed but living somewhere hilly you soon discover there is no single 'perfect' gear - having one for climbing and another for cruising sounds very appealing. That's *exactly* it. and the ratio difference means you can have gear for cruising along at a decent lick, say 78", and still have a 56" gear for the hills, which should get me round some big rides. hopefully. That sounds like a good choice of gearing. I used to run an old, heavy, 3 speed Sturmey hub which gave me a nice range - something like 39", 54" & 70". It got me around Derbyshire and the Peak District quite comfortably. The ol' legs have got a lot stronger since then so something like 56" / 78" would probably be fine. The project bike with that hub sounds interesting - any clues as to what it'll be ? The project bike with that hub sounds interesting - any clues as to what it'll be? Nice big steel tubes. Best of both worlds. Or not.